Thus reads the sign posted on the outskirts of Redemption, Kansas. And they mean it. Unfortunately, young cowboy Bill Harvey has sustained a serious leg injury in a stampede caused by rustlers, and his partners have little choice but to leave him in Redemption to convalesce. Bill wants to finish out his first cattle drive, but is forced to remain in the town he describes as a backwater settlement for at least a week until he is able to walk. He finds himself under the care of a grizzled storekeeper and his beautiful daughter, Eden… and it doesn’t take him long to realize that the local peace officers are not quite what they seem. 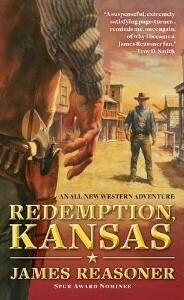 There is a dark cloud over Redemption, Kansas –the citizens live in fear. The more questions Bill asks, the more dangerous life becomes for him… and for the family that has taken him in. This is a suspenseful story, with well-drawn characters, that I found hard to put down. There is more action than you would expect in a tale with a stove-up hero, a strong young man who is not used to feeling helpless, and the tension builds as Bill figures out what is really going on but can’t quite figure out what he’s going to be able to do about it. Bill’s frustration at his physical limitations, his youthful innocence, his fears for his new friends, and the well-developed romance with Eden make him a very sympathetic character. The villains, especially the scar-faced deputy Zach Norris, are formidable. This is the first new western to come out from James Reasoner under his own name for a while. He writes well no matter what name is on the cover, but I’m glad to see him getting full credit for this one. 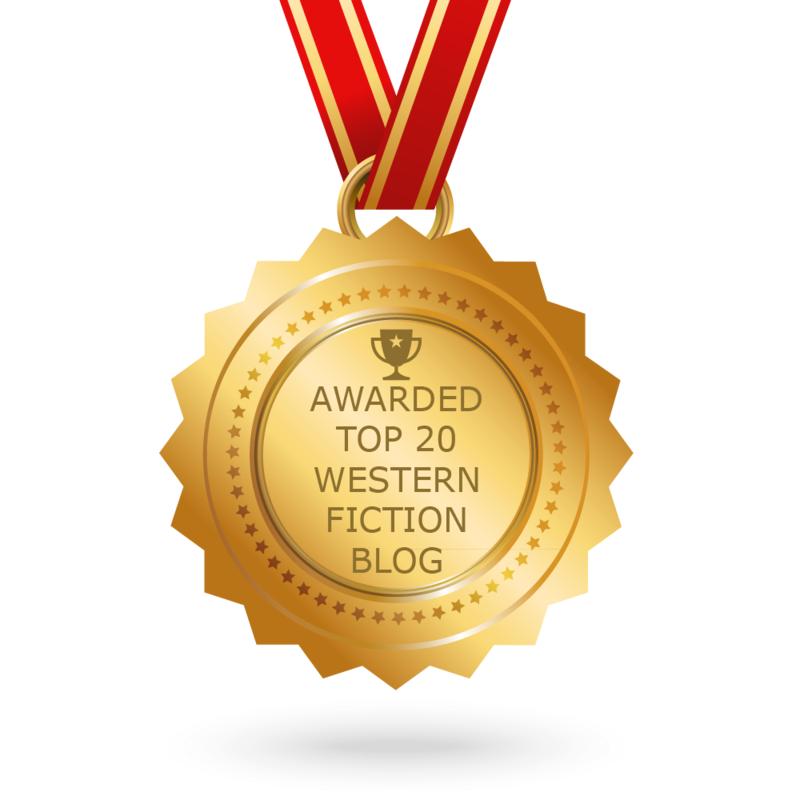 The name “James Reasoner” popped out at me in the ‘90s when I read several short story anthologies in a row that had tightly-written, powerful tales of his –“Wish Book” stands out particularly in my memory –and those, plus the classic Under Outlaw Flags, quickly made him one of my favorite writers. Reading his new book makes me remember why. If you want to read a good traditional western, I give this one a strong recommendation. THE SNAKE DEN, by Charles T. Whipple writing under his Chuck Tyrell pseudonym, is the first book in Solstice Publishing’s new Western line. It’s a fine debut for the line. The protagonist of THE SNAKE DEN is fourteen-year-old Shawn Brodie, who is sent to Arizona’s infamous Yuma Prison for stealing beef, even though he’s actually innocent of the crime. Once he’s locked up, Shawn faces all sorts of trouble, mostly from the brutal and perverted head of the guards but also from the sinister, crippled inmate who runs the prison’s criminal underground, a Mexican outlaw determined to escape, and assorted other inmates who become Shawn’s enemies for one reason or another. After one ruckus, Shawn gets tossed in the Snake Den, the solitary confinement cell built into a cave where rattlesnakes can crawl in with the prisoners. However, not everybody is out to make life miserable for Shawn. His cellmates turn out to be decent sorts: a gambler who teaches Shawn how to play cards, a gunfighter who gives him the fundamentals of handling a revolver, and a man everybody takes for Chinese but who really isn’t, who teaches Shawn the martial arts. Shawn also has allies in the warden’s wife, the prison doctor, and a girl from Yuma who visits the prison when it’s open to the public on Sunday so the prisoners can put on boxing exhibitions and sell things they’ve made. The prison yarn is a staple of genre fiction, and Whipple has written a very good one in THE SNAKE DEN. Having researched and written a book partially set in Yuma Prison myself, I know he’s done an excellent job of portraying that notorious hellhole. Shawn is a very likable protagonist, and the other characters are fleshed out and well-developed. 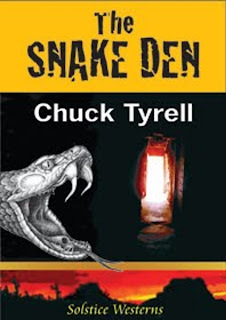 Given its setting and subject matter, it’s not surprising that THE SNAKE DEN is considerably grittier than the fine Black Horse Westerns Whipple has also written under the Chuck Tyrell name. If this is an example of what we can expect from the Solstice Western line, I’m certainly looking forward to the rest of the books.